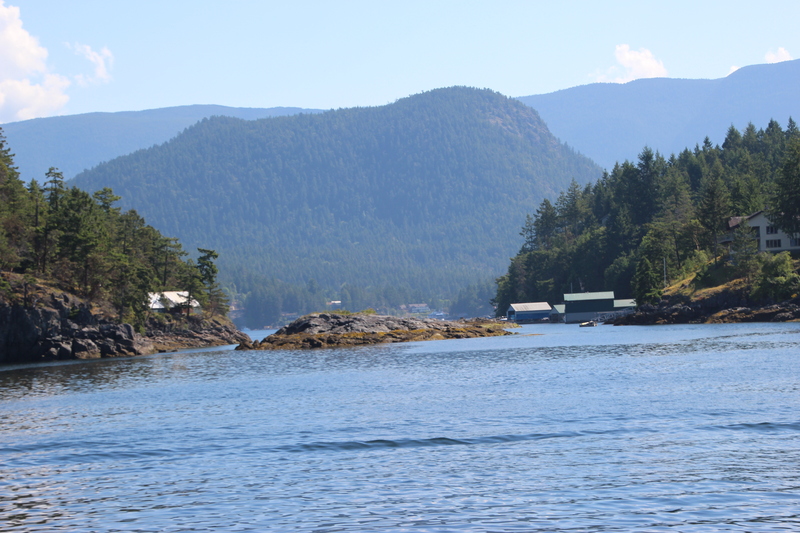 We pulled out of Silva Bay on day 3 of our passage through B.C. 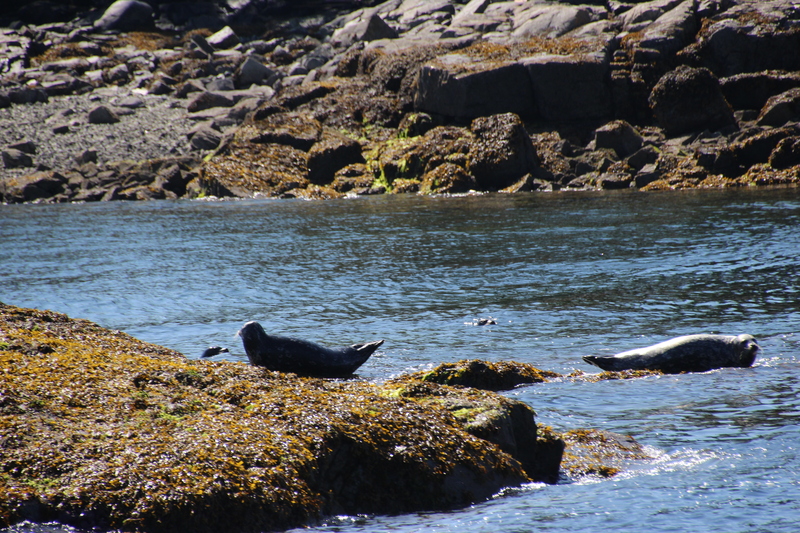 We headed North across the Strait of Georgia to Pender Harbor. The weather was suppose to be calm so it was to be an easy crossing. But the weather was understated and we encountered some wind and waves. No problem though for Cabernet, she rode along like this is what she was made for. As we got to the east side of the Strait 3 hours or so the sea calmed down to actually glass the last few miles into Pender Harbor. 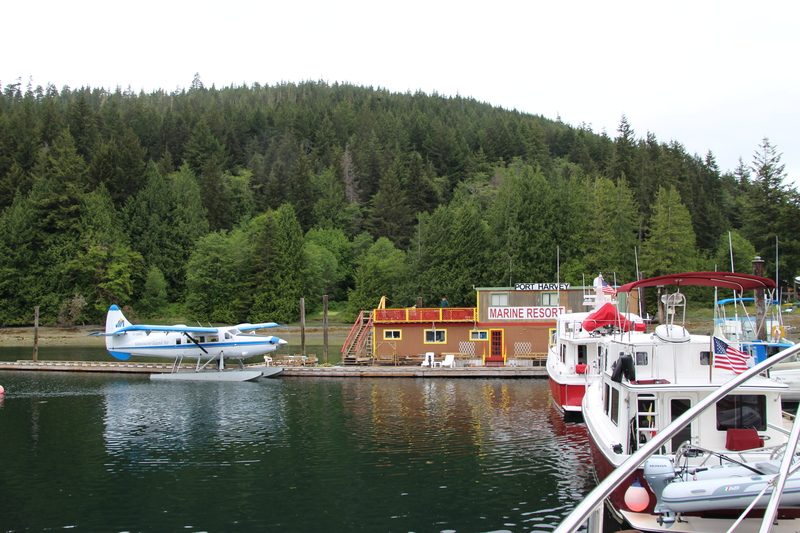 We pulled into Garden Bay Pub Marina. No lunch for us. The Canadians had a 3 day weekend and they had no food left for serving lunch. So fixed lunch on the boat and then they had us altogether for dinner on the veranda. NICE! Lanette and I got the tender down and went shopping across the bay at an IGA grocery store. Parked at Madiera Park Marina and walked over the hill to the store. Not far and it was warm. This is called the “sun coast” aptly named. 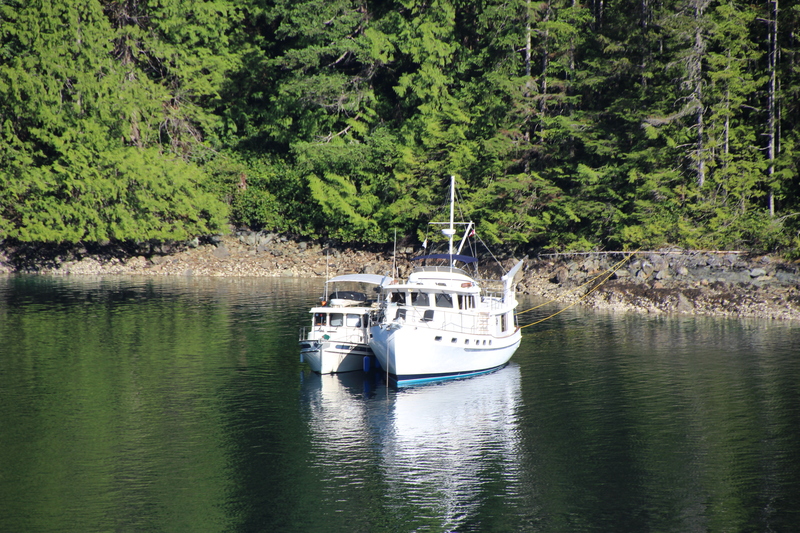 Next day it was Pender Harbor to Teakerne Arm, in the Desolation Sound. Left at 7AM no time to work out. Lanette’s having a fit. 55 mile day today one of our longest.Weather was good and sailing easy and great. Passed Powell River where they took a bunch of world war ll Liberty ships and scuttled them to make a break water. Desolation Sound was a visual wonder going through. Seems like you are in the Alps but with water. Not a lot of boats yet, still before the real boating season for here. 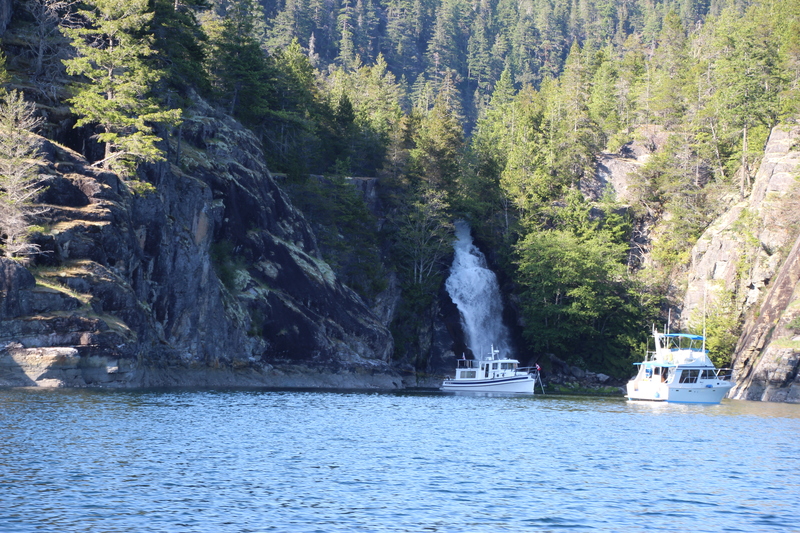 We reached Teakerne Arm and it is just that a very deep arm of a cove with a beautiful waterfall at the end. Now this separated the boys from the men trying to anchor in 200 feet plus water right up to the shore which is shear rock wall and then stern tying! Cabernet is equipped with forward seeing sonar and we were able to find a shelf that went from 175 ft. then to 125 ft. and then to 41 ft right up to the shore. Now remember we have a 16 foot tide and it was out. So we let down our anchor and hooked the second shelf, we let out 225 feet of anchor chain and backed up to within 20 yards from shore. How did I know? I used my laser that I use to find yardage on the golf course. Ha Ha! Took a rope ashore and around a tree and back to the boat. Done. In place for the night. We had another boat with us that the folks have never anchored so the we invited them to raft up to us and we all were secure for the night. 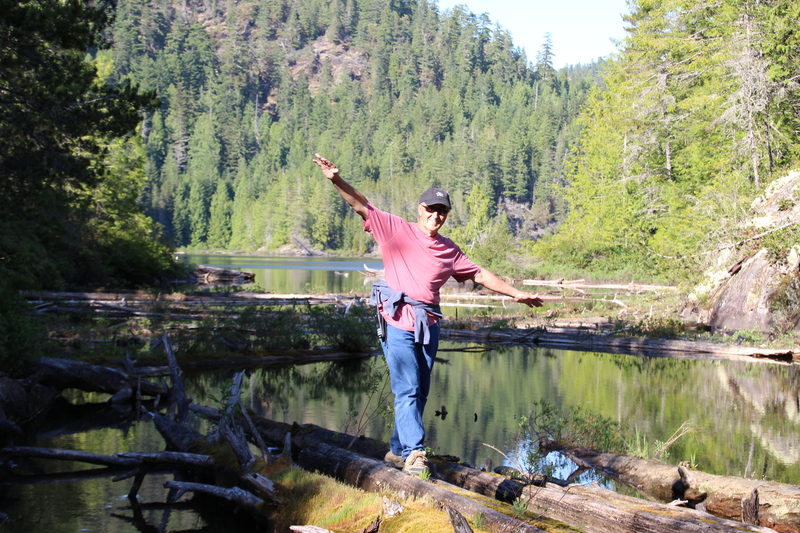 Took a hike up to a lake at the back of the waterfall where they use to cut trees and run them down the waterfall. There was an old rusted “donkey” at the top of the water fall. The logging operating in the 1920’s used this donkey to pull logs from the lake to the waterfall and then the log floated down to the water below where they could raft them together and take them to a mill. This must have been ruff place in the 20’s. Feels now like there is no-one withing hundreds of miles. We got to sleep in this morning and also work out YEA….. Ron took Bailey out for her morning business and while out he found a tender in the rocks so he got it and went around and found out that Airship had lost her tender some time in the night. We had to go through Yuclata and Dent Rapids this morning so we needed to time it just right for slack tide. After coming through Dent Rapids the Dent Island Lodge is right there owned by the Nordstrom Family. This place was surrounded by some very expensive homes and a golf course of all things. Out in the middle of nowhere?! People have to fly to get in here, There was also a resort that looked like a Disney operation. Huge and no way to get here but boat or float plane. Go figure, the rich and famous only. We ended up at Blind Channel for the evening. No cell or internet service. It was a very early morning today we had to be up and ready to head out by 5:30. What happened to sleeping in and retirement???? This was the first morning that the sun was not shining when we left. We rounded our way through and headed into Johnstone Strait at which time we were hailing 30 mph winds and 2-3 ft swells. We just jugged along. Finally ended up at Port Harvey Marina tucked way back in a channel. You would never know it was there. Plenty of room for all 8 boats plus an airplane. Sun still has not come out. I guess our weather is changing darn. Bailey was able to play with a dog they have so she finally got some exercise. On the other hand the dog did not like Brandy and she was not about to attempt to go outside. The owner said a Grizzly Bear with four cubs went through yesterday. She must have adopted two of the cubs. Wish we could have seen her and the cubs. I am sure this is just the beginning and there will be a lot more. We have had very little cell or internet service so we are really out of touch. Here are a few pictures. I am posting a lot more in our photo gallery. It has only taken me 2 hours to do. Wowee! Be careful you two! We are enjoying your adventure! Miss you!